Michael DiPietro is more of the extrovert while his Windsor Spitfires teammate Gabe Vilardi seems more subdued. But they’re both all business during the Mastercard Memorial Cup as the Spitfires aim to book their ticket to the final with a win over the Erie Otters in a battle of two undefeated teams to conclude the round-robin. “We don’t think we’re underdogs,” said Vilardi, acknowledging the tendency to overlook the host team since they were eliminated in the first round of the OHL playoffs. Regardless of how they finish at the Memorial Cup, Vilardi and DiPietro’s attention will likely shift to the NHL Draft after Sunday since they’re both high-end prospects. 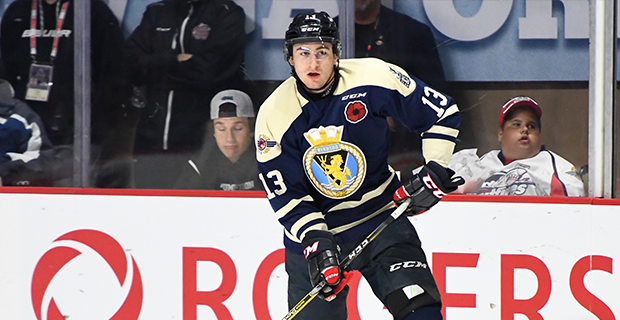 ISS has Vilardi listed at third in their rankings, the only prospect in the Memorial Cup in its top 30. Meanwhile, DiPietro is one of the top goaltenders in the draft and could go somewhere in the second round, maybe even late in the first. ISS had him ranked sixth in their last release. DiPietro, Vilardi and other draft eligible players are grateful to have the Memorial Cup to focus on this week. “Especially in a tournament like this, I don’t think you can be self-absorbed,” said DiPietro, who finished third in voting for the OHL goalie of the year award. DiPietro was Windsor’s Red Tilson Trophy nominee after ranking near the top of the league in goals-against average (2.35) and save percentage (.917). He and Vilardi have become good friends and push each other a lot as most teams with NHL Draft prospects do in an effort to achieve a common goal. DiPietro’s playful nature comes out when he describes his relationship with Vilardi. “We can get on each other’s nerves. I know it makes Gabe tick and sometimes I like to do that a bit,” he explained. Vilardi missed time with a few injuries this season, but still collected a team-leading 61 points (29 goals and 32 assists) in 49 regular season games. A natural centre, Vilardi also adjusted to being put on the wing as Windsor coach Rocky Thompson had an abundance of centres to work with, but still wanted to find a way to include Vilardi in the top six. That move was tough at first, but Vilardi has benefited from being able to showcase his versatility. “I can play both positions now and moving forward, I think that’s huge for me,” he said. “You never know where you’ll slide into a team’s line up. There are other solid NHL Draft prospects at the Memorial Cup as well, such as forward Ivan Lodnia from the Erie Otters, Sea Dogs backup goalie Alex D’Orio and defenceman Jarret Tyszka, part of the Seattle Thunderbirds squad that was eliminated on Tuesday after a crushing 7-0 loss to Saint John. Further down the list, players like Seattle’s Sami Moilanen, Erie’s Gera Poddubnyi, and Saint John’s Cedric Pare are draft eligible too. Windsor had three players – Mikhail Sergachev, Logan Brown and Logan Stanley – picked in the first round of last year’s draft. Vilardi and DiPietro hope to represent the organization well once again. “They were obviously all high picks and went through it last year,” Vilardi said when asked what advice he was given from anyone drafted previously.